Next week, Brandon Schaefer is scheduled to report to a U.S. Army base in Alabama where he will immediately begin training as a helicopter pilot. 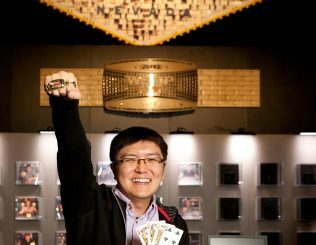 For the moment, he is basking in the spotlight as the latest WSOP bracelet winner. 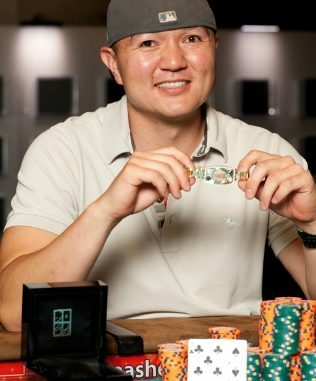 The 31-year-old former professional poker player from Seattle, Washington, won his first WSOP gold bracelet in the $1500 buy-in No Limit Shootout title, collecting USD $311,174 in prize money. Schaefer (pictured left) topped a field totalling 1138 entrants. This was the first and only tournament Schaefer planned to play at this year’s WSOP. The latest WSOP champ enlisted in the military nine months ago, following a seven-year stint as a professional poker player. Schaefer now has a six-year commitment to the US Army and yearns to serve his country proudly as well as see the world as an aviator. • Adam Friedman won Event #15, the $5000 buy-in Seven-Card Stud High-Low Split World Championship tournament. 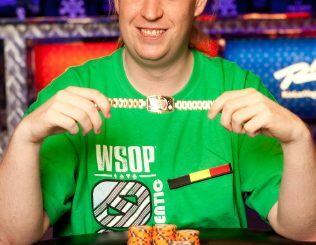 The 30-year-old poker pro originally from Ohio (and now living in Las Vegas) collected his first gold bracelet following a number of deep runs and close calls over the past seven years while playing at the WSOP. First place was USD $269,037. Friedman’s victory was made all the sweeter by the manner in which he overcame several challenges, most notably a fierce effort by eventual runner-up Todd Brunson to achieve what would have been a second career gold-bracelet victory. Friedman came back from being down by more than 2:1 in chips on at least three occasions, finally slaying Brunson beast in a physically and emotionally exhausting three and a half hour heads-up ordeal. The widely anticipated Phil Hellmuth-Phil Ivey showdown never materialised. Hellmuth ran into serious trouble early on the final day and went out in 15th place while Ivey fared a little better, reaching the final table before bowing out in seventh place. • Event #16, the $1,500 buy-in Six-Handed No-Limit Hold’em tournament is almost down to the final table with nine players remaining, including Mike Matusow, Matt Glantz, Mark Radoja, and Matt Matros. Robert Muzzatti currently leads the field with 1,445,000, and Mark Darner is right behind him with 1,412,000. The lightning pace of this event continues to garner interest – consider there were 1604 starters and only 137 survivors after the first day’s action. Players were eliminated in the first nine levels at a rate of 25 seconds per player and then at a still considerably rapid two minutes per player once the bubble burst. • Another huge line-up of events at the Rio today includes day two of Event #17, the $10,000 buy-in Pot Limit Hold’em tournament. There are 69 players remaining. Steven Landfish is currently the chip leader with 224,500 but a world class line-up of players remain in contention for this title including Australia’s Jason Pritchard, who finished in the top 15 for the day. Event #18 the $1500 buy-in Seven-Card Razz tournament continues with 136 players remaining from the starting field of 179. Tommy Vedes is off to another strong start this summer, finishing the first day on top of the counts with 44,600. New events kicking-off today are Event #19, ($1500 No Limit Hold’em) and Event #20 ($5000 buy-in Limit Hold’em).